Delta's new safety video with memes is really bad. Delta’s New Safety Video Is Painfully Bad. Here, Watch It. It’s hard to even know where to begin. Basically, don’t do this. 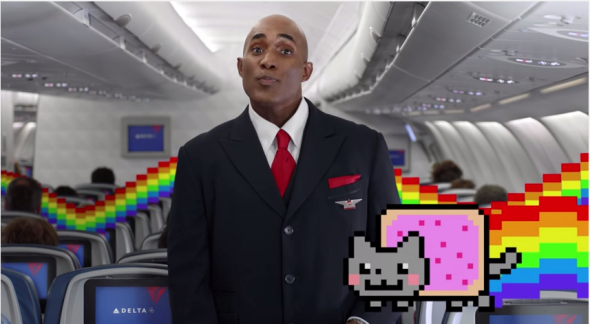 Delta Airlines just released a new safety video to show at the start of its flights, and it’s crammed with meme references. The goal is presumably to get people to listen to the safety instructions while also trying to make the airline seem cool and likable. But it’s all just too much. The problem is that memes are inherently fickle, and invoking one for corporate promotion is like using someone else’s wand. The sacred means of participating in a meme is simply to share it for the lols. If you clearly have an agenda, you are breaking this unspoken pact. Slate staff reactions to the video included: “weak sauce,” “how does it take SIX MINUTES to communicate this information” (though the video is actually five minutes long), and “it sullies everything pure about the Internet.” To the second point, even though other successful safety videos have been in the five- to six-minute range, the Delta video does seem to drag. It feels like the meme jokes are just slowing it down instead of keeping things moving. Another issue is that the meme re-enactments seem off. The “Charlie Bit My Finger” impression is all over the place, the cat on a Roomba in a shark costume looks bored instead of intent on destroying everything in its path, and the screaming goat just has so much unused potential. Also, Delta apparently didn’t get the memo about the growing collective desire to never speak of or reference the Harlem Shake again. It’s always fun to be in on a joke, and it’s occasionally possible for a large corporation to prove that it really does have its finger on the pop culture pulse. But for the most part, being a huge company (especially one that we trust with our lives as our bodies hurdle through thin air) means trading cool points for profits. This is why we can’t have nice things.